This is hands down my favorite quilt yet. FAVORITE. I love this fabric. I knew I wanted to make a modern looking quilt with this Joel Dewberry line, but I couldn’t make up my mind on the design until I started cutting the fat quarters into strips and going for it….which is scary. I used 8 fat quarters total, not counting the white fabric. I used EVERY last piece of the fabric down to the last tiny strip! I had the picture of this in my head, and I was nervous once I started cutting up all my fabric that it would be a total wreck….lucky for me it turned out or I would have been one grumpy momma! The finished blocks are all 9 inches square, and I think that its 60 in. by 77 in. Just beautiful! Love the fabric and love your design! Ooh, so lovely! I think that's an awesome line, too, and I love what you've done with it. Way to go for using every little bit of it! Feels good to have nothing go to waste. That is lovely – so well balanced. This is just lovely!!! Wow, wow, wow!!! This is lovely…. the simple blocks paired with the solids are so elegant. I wish I had time to chop into my MM soon but it will have to wait! I love your quilt. Wonderful design! What a beautiful quilt! I wish I had some of your creativity! Ooo it's gorgeous. I love it too! Beautiful quilt! Doesn't it feel good to use every little piece of fabric? OH! I love it!!! i love the pond palette so much! you have made it even prettier! Oh my goodness gracious, that is GORGEOUS!!! I haven't stocked Modern Meadow but this quilt alone makes me want to run to get it in. LOVELY. I want it for my house! Gorgeous quilt…I'm still deciding what to do with my modern meadow…this is terrific inspiration! WOW! It is awesome! Kudos to you for going for it it really paid off big time. This quilt is beautiful!! I would like to know how you organize your time to find the time to work on new prjects. I have five children ages 11-8 months and I marvel that you can get so much done! Please share your tips on how you break a project down, how you find the time to work in sewing (is it scheduled or spontaneous) etc….that is if you ever have the time left to share! this is so stunning…i am so glad for you that it turned out. This is gorgeous!! You should be very proud! I LOVE this. Your fabric choices (as well as design) are great! To die for!! Love, love, love it!! It looks lovely! You can't beat a simple, modern design for showing off great prints! I love this one too! I love the colors and I am a big fan of squares. My husband makes fun of me. Great job. Lovely! I like how you have got the trees and flowers centralised in the blocks. I think this range is one of my favourites too. I have some newly stashed! i love it…the effect is simply fresh and clean look..great job! It's Gorgeous…Love the Fabrics too..
Really beautiful. This page just got dropped right into my "amazing quilts" folder on my favorites menu. Thanks for the inspiration! I really like that. I had a similar idea for a load of Amy Butler FQs I want to use but haven't been able to bring myself to cut into them yet. I like the way some of the coloured centres are off centre, if that makes sense, in other words not all the blocks are regular and the same. It makes the whole design more interesting. It is very neat looking I love it. 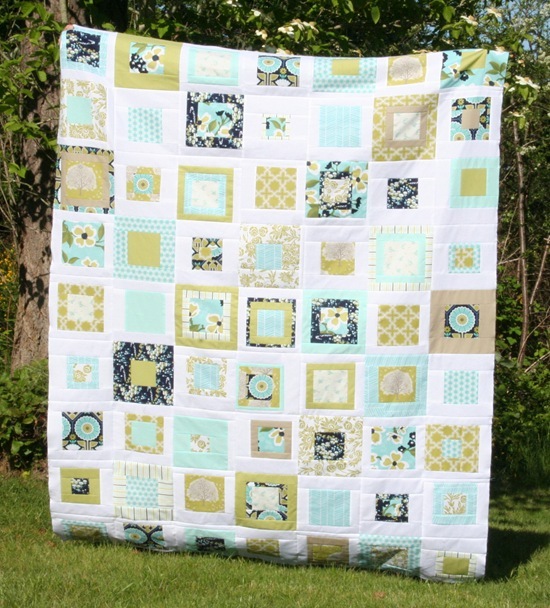 Did you use Mary's Quilt pattern for this quilt? Love it! This is so gorgeous!! I'm planning a quilt for some good friends and every time I think I've settled on a plan I see another quilt that I love. Can't wait to see it finished! Love this quilt! I share your love for MM :) I'm working on an MM quilt of my own right now! This is beautiful! I have some left from a baby quilt I did on commision so I may try something like this. The colors in this quilt are fabulous. You did an awesome job. 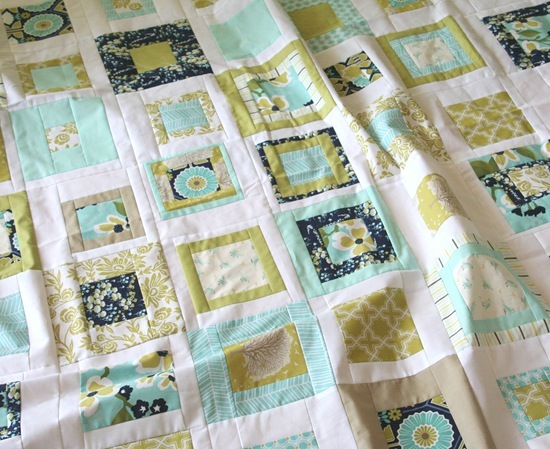 What a grogeous quilt – and that fabric is devine! Well done you! Your quilt is beautiful. Did you have a pattern or make it up as you went? I just love it. what a great use of pretty fabric! i love the blues and greens. i think i probably would have walked right past the fabric and thought hmm… nice colors and nothing more. so i'm really impressed that you've come up with a great design to showcase it. This is a flirtatious quilt, saying, "Come snuggle with me!" It's so fun and I am a huge fan of all things green. You did a beautiful job. Thanks for sharing. Gorgeous! I love Joel Dewberry fabric but you took it the next level. Congrats!! oh my gosh, I LOVE that.I love the modern feel to it and the fabric is my favorite. Great job!